Entertain like a rock star with this multi-function media cabinet with integrated wire management. This unit can be configured as a wall or corner mantel, making it flexible for your space. This mantle features a shelf for electronic media components. A beautiful and substantial tiered molding top supports today’s TVs. 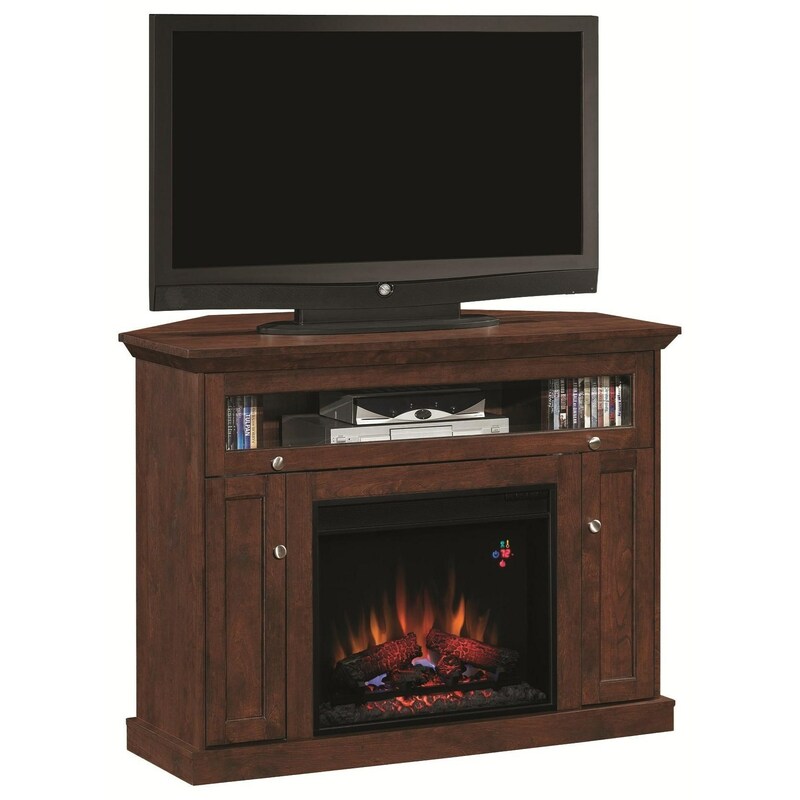 This television fireplace console also features flip-up door with piston hinges, fully open storage for CDs and DVDs, adjustable shelves finished on five sides, and 3-way adjustable concealed euro hinges. This fireplace media mantle can be used with or without heat for all season enjoyment. The Windsor Dual Entertain Media Fireplace Mantel by ClassicFlame at Darvin Furniture in the Orland Park, Chicago, IL area. Product availability may vary. Contact us for the most current availability on this product. This traditional style media mantel is perfect for any room. The unit is multi-functional with two side cabinets that are great for media storage. A flip up barrister door with a glass panel opens to reveal added storage for electronic components. This dual function furniture piece can be used as a wall or as a corner unit. The mantel features tiered molding and surrounds a 23” ClassicFlame Electric Fireplace Insert, which can be used with or without heat for all season enjoyment. The Windsor collection is a great option if you are looking for Transitional furniture in the Orland Park, Chicago, IL area.